In this article we take a look at what is probably the best known name in electronic cigarettes, South Beach Smoke. The popularity of South Beach Smoke is notable thanks in good part to the exposure that the brand has achieved in some very reputable magazines and TV channels. However, it would be unfair to fully attribute the recognition South Beach Smoke has earned to the media. Their reputation is supported by the high quality of their products and the trust that Vapor Group, the company that manufactures them, inspires. South Beach Smoke aims to offer a satisfying vaping experience that is cleaner and substantially less harmful than regular tobacco cigarettes. South Beach Smoke has been getting great reviews from the vaping community. 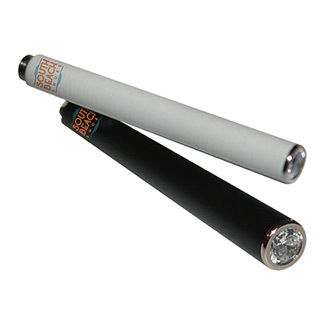 They offer a solid e-cigarette but more advanced personal vaporizers as well. 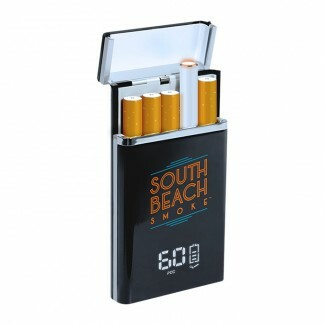 South Beach Smoke has some really cool devices that are worth considering! South Beach changed their image in the last year, with new stunning visuals to portray a modern look that pushes e-cig design to the next level. This shows that they continue working to maintain their top place in the industry. Even though they are already one of the most popular electronic cigarette companies they strive for innovation and to stay up to date so as to continue offering a great experience for their customers. The Air is basically broken up into three compartments, the battery, the atomizer/flavor tank, and the mouthpiece. The battery is a 350 mAh rechargeable lithium ion battery battery which is comparable to the rest of the field (more on the battery below). The mouthpiece is a pretty standard mouthpiece that doesn’t really deserve mention above and beyond the fact that it’s very comfortable and feel natural. Probably the most unique element of the Air is the atomizer/flavor tank; unlike other designs that make the atomizer part of the disposable cartridges we find that this one is baked directly into the flavor tank creating what is called a “Wick Atomizer”. This unit will likely last somewhere between 3 and 6 months depending on your use. 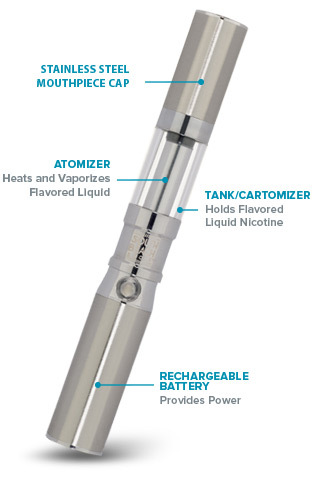 The e-cig is simply refilled by pouring one of South Beach’s flavor packs into this tank and you’re all set to go again! Because the atomizer is its own separate unit some have argued that this is actually a cheaper alternative because you’ll be saving money in the long run. We haven’t run the math on it but the savings seem negligible at best. If the Air sounds too intimidating for you than the South Beach standard units may be the way to go. The standard unit is very similar to the traditional e-cig and will be a familiar sight and feeling to those newly escaped former smokers. 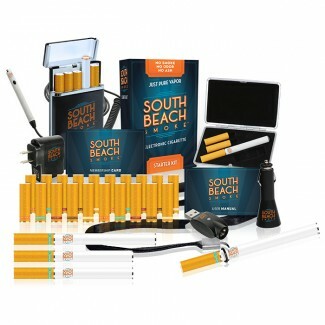 If you’re new to e-cigarettes then it would be hard to do better than South Beach’s offering. As is the case with many of the competitors, the South Beach unit is basically housed in two pieces. 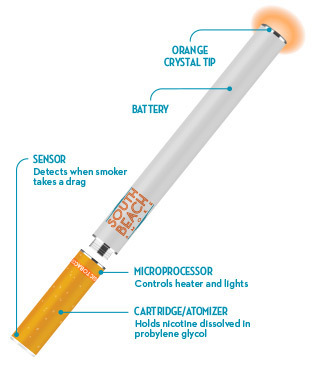 The main body of the cigarette houses the lithium ion battery and the tip indicator light. The “filter” or cartridge of the e-cig contains the flavor cartridge, the atomizer and the microprocessor that runs the show. Changing cartridges is a breeze as all you have to do is unscrew the old cartridge and screw in the new one. The battery is easily charged via the included wall adapter or with any standard usb port. (more on the battery below) For those who don’t need all the bells and whistles, or for a newcomer to the world of e-cigs looking to keep things as familiar as possible; South Beach’s standard unit is definitely the way to go. South Beach offers two types of batteries. The standard battery is $17.95 if you need a replacement and is described as 2.5 inches long and is alleged to be good for 300-400 puffs depending on use. The other option available is the high capacity battery which is described as 3.25 inches long and good for 500-600 puffs. A replacement high capacity battery will set you back $22.95. Both options are available in either black or white and fully equipped with South Beach’s industry leading SuperMax battery technology. They also offer your choice of automatic or manual switch. For those of you unfamiliar with the difference, a “manual switch” e-cig will have a small button on a side you need to press to activate the atomizer every time you take a puff while the automatic switch sports an on-board computer that turns on the atomizer whenever you puff. There are pros and cons to both but ultimately it’s pretty subjective. The automatic switch is more convenient and I feel better fills in the illusion of smoking. With the manual switch you will need to push the button every time so you suddenly become very aware of the fact you have a machine in your hand which I feel detracts from the illusion. With that said, the manual switch affords you much better control over the throat hit and is particularly useful for those who like very flavorful and intense puffs. If it’s feasible I’d recommend you try both and determine whether you’re an auto or manual person. Thanks to the improved battery technology that SuperMAX offers, the Vapor production is also stronger, providing users a rich cloud that is very pleasant and an immensely satisfying. This is particular true of their Tobacco blends which I feel stand out in the areas of flavor and sensation. In fact, South Beach is usually the first alternative I’ll recommend to long time or heavy smokers as I’ve yet to find a competitor that gets the throat hit so close to the real thing. Even though the batteries are not as slim as what other brands offer, the fact that the vapor and flavor are so intense, makes the added bulk worth it. The company offers a great variety of flavors that can be enjoyed thoroughly thanks to the SuperMAX battery which ensures that the richness of the flavor is maintained to the last puff. South Beach Smoke’s flavors stand out for their natural taste and their intensity. They boast an extensive selection of flavors such as Classic, Gold and Blue Tobacco. 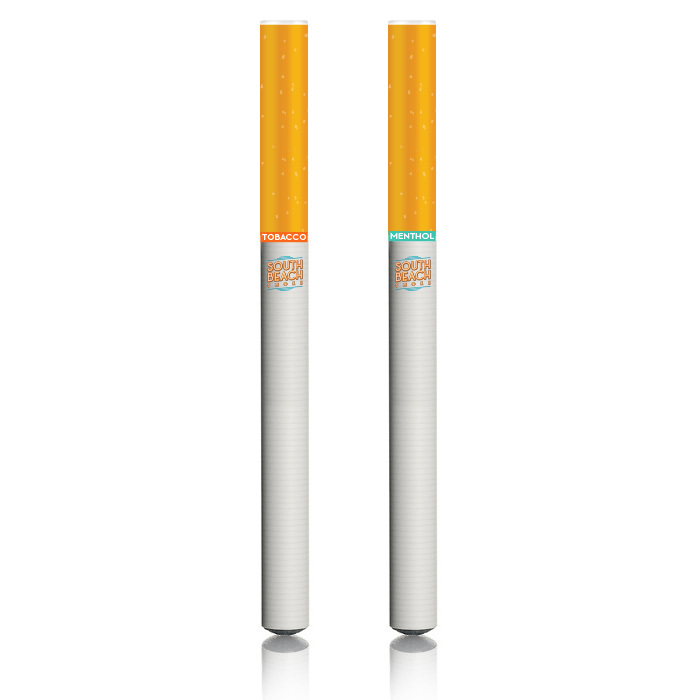 You can also opt for the refreshing taste of Menthol, Peppermint, Orange or Tobacco Mint. For a sweeter option, go for their Vanilla, Chocolate, Cherry, Peach, Lemon lime and Watermelon. They have also interesting choices such as Grape Hookah, Double Apple Hookah and Pina Colada among many, many others. If none of those strike your fancy then I’m delighted to tell you about my favorite part about South Beach Smoke; their custom made flavor blends. It’s simple! 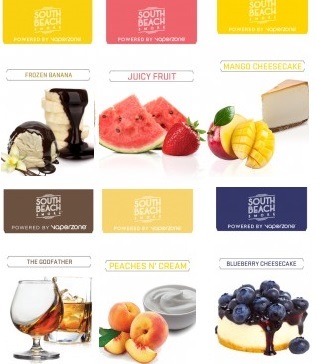 You just pick out a couple of flavors from South Beach’s extensive list and their flavor experts will blend you up a batch to your exact specifications. Given their vast array of pre-made flavors this provides for countless combinations! There are kits for every budget and for every kind of user. Their most basic option is the Reusable Express kit which retails for just $21.99. This is a good option for new electronic cigarette users that want to learn how these devices work and would like to familiarize themselves with it. As with all the other kits available through South Beach; the battery in the Express Kit comes complete with the SuperMAX technology for extraordinary battery life. This kit contains one standard battery, two cartridges (choose between Classic Tobacco and Menthol) and one USB charger. 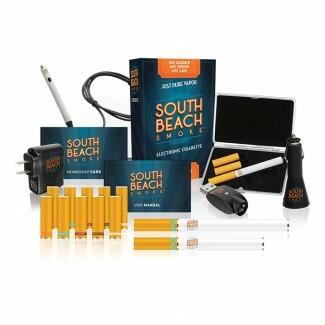 For those of you looking to try out the South Beach Air you can get a starter pack starting at $29.99 but be warned that this kit only contains the unit. If you decide to go this route don’t forget to head over to the flavor section and pick out a couple of South Beach’s signature blends or try your hand at creating your own signature blend! For an even more comprehensive experience, you can choose their Deluxe Starter Kit which includes everything you need to fully enjoy your vaping. The Deluxe includes one standard SuperMAX battery, one extra capacity SuperMAX battery, one USB charger, one wall adapter and ten cartridges of your chosen flavor. All of this for just $59.99! You can upgrade your kit further by opting for the Deluxe Plus Starter Kit at $89.99. This kit includes every element that you’d find in the Deluxe plus several additional accessories (see what I did there?). On top of everything included in the Deluxe, the Deluxe Plus includes one Power Cig (simply connect it to the USB port and enjoy your vaping while you are waiting for your batteries to be charged), one car adapter and a stylish carrying case. If you want more extras, you can choose their Deluxe Ultimate Starter Kit ($159.99) that includes everything contained in the Deluxe Plus and additionally comes with one personal charging case (which allows you to charge the batteries on the go), one lanyard to conveniently carry your e-cig, and twenty nicotine cartridges in your chosen flavour. For an experience that can be shared, choose the Deluxe Couples Kit. This package combines two Deluxe Start Kits so you can enjoy your vaping in the company of a beloved one and is available for just $109.99. 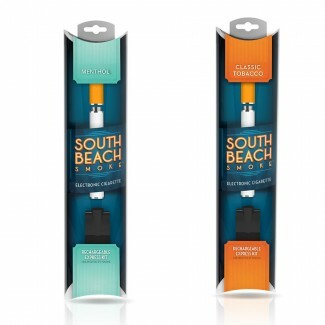 Finally, South Beach Smoke also offers disposable e-cigs that are great for those that are trying e-cigarettes for the first time and for any moment in which you may need a fast and convenient way to enjoy your vaping. The prices for their disposable models range from $11.99 (pack of 4) to $29.99 for a pack of 8.To learn more, head to our South Beach Smoke Disposables review. 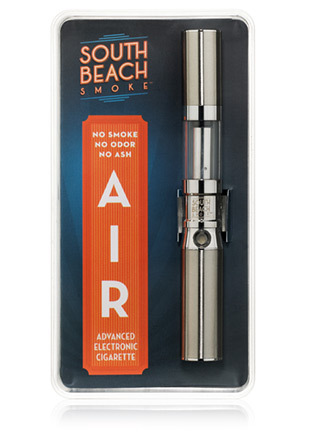 There is no doubt that South Beach Smoke is a great option for new and experienced electronic cigarette users alike. Even though they have achieved popularity and enjoy a large customer base they are continuously working to deliver greater quality in their products through innovation and better service to ensure the satisfaction of their customers. The vapor production is satisfying and the vast array of flavors are delicious, satisfying, and notably lacking in that artificial taste. South Beach Smoke is guaranteed to be a highly enjoyable vaping experience for old-timer and newcomer alike!